The 2001 earthquake that brought down a length of State Route 99 running through downtown Seattle was a measly 6.8 on the Richter scale. But rather than rebuild the Alaska Viaduct, as the double-decker section was known, city officials instead decided to take the freeway underground in their very own Big Dig. 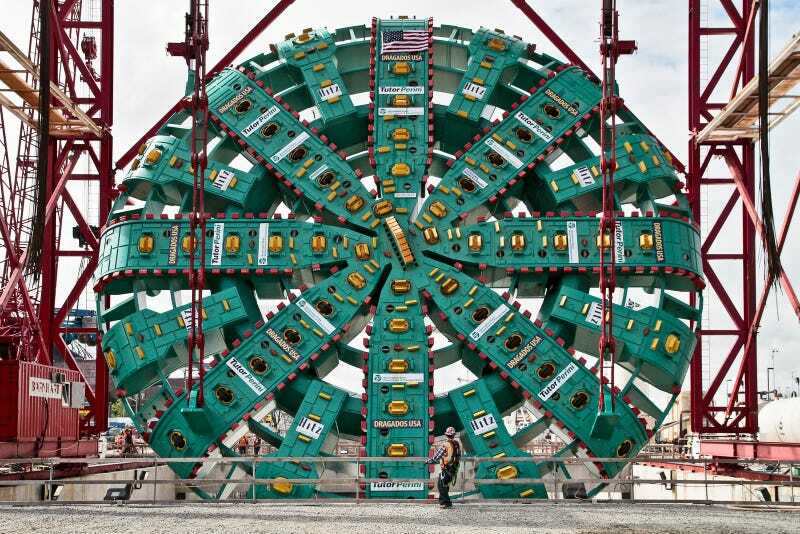 To do so, Seattle's using "Big Bertha:" the biggest Tunnel Boring Machine on Earth. Built for the dig by Hitachi in Osaka Japan, the $80,000,000 Big Bertha measures 57 feet in diameter, 325 feet in length and weighs 7,000 tons. She's commanded by a crew of 25 and is designed specifically for the soft soil found under the Emerald City. As Bertha winds her way under Seattle and chews through an estimated 35 feet of soil a day, her cutterhead will exert 88,000,000 pounds of pressure on the forward wall of soil, grinding down the strata and depositing it on a conveyor belt directly behind it. Soil conditioners are added to the debris, rendering it an easier-to-manage goop as it is pushed back up to the surface, 80 feet above. To prevent cave-ins, Bertha automatically erects pre-fab concrete panels and seals them with grout to create the tunnel walls using a pair of erector arms. Also behind the cutterhead is the trailing gear, a series of three cars containing the control room as well as the crew's workshop, power cells for the hydraulic wall-erecting arm with the backfill grout system, and electrical transformers, respectively. Since most of the boring process is automated, the operator and a pair of engineers, oversee the cutting process while the other 22 crew members survey the route ahead, maintain the cutterhead teeth, and operate the non-automated tunnel-wall erector.